The Hive Camera is something of a mixed experience. Although this works well as a cheap camera in isolation, we also feel that's its biggest downside: despite the branding this isn't part of the Hive system in its current guise so there's little to tempt the loyal to buy it. Hive, the smart home solution, has been expanding its system's offerings to cover the whole home - stepping beyond the core of smart heating, by recently adding sensors and lights. And now there's Hive Camera, the company's rival to devices like Nest Cam, an indoor camera that offers app control, remote viewing of your home and a range of motion and sound alerts. However, the most surprising thing about the Hive Camera is that it's not really part of the Hive system. It's a separate device with a separate app that's not linked to any other Hive devices. And that's not really what the connected home is all about. The Hive camera looks like a fairly conventional home camera. It's finished in white plastic, with the round camera body set into the stand, which offers some flexibility so that you can set it at different angles. The stand also allows various mounting options, including wall-mounting if you wish, with screws and wall plugs included in the box. There's a single cable coming from the rear which connects to the mains. There's plenty of cable length (about 2m) so it's easy to plug in and position where you want it. Being wired means it's not as practical as battery-powered cameras like those from Arlo (although it's similar in function to the Arlo Q), but at the same time you can just plug it in and forget it. There's a status LED on the front of the camera which illuminates green when it's connected, with the option to turn this off if you don't want the constant glowing. The face of the camera is black, which helps to hide the infrared (IR) illuminators surrounding the lens in the centre. This is an indoor camera for indoor use only, so there's no weather protection or anything else. The Hive Camera is actually a Hanwha-made camera - a rebranded SmartCam HD Plus, which is also available with Samsung branding elsewhere - which perhaps explains why it feels like an off-the-shelf solution, rather than something that's been deeply developed by Hive, for Hive. As we said: the Hive Camera doesn't use the same app as all the other Hive devices and it doesn't connect to the Hive hub, which you might already have if you're a Hive user. This app situation is a little odd, as you're probably interested in Hive Camera because you have other Hive devices and want to keep building your system, rather than have to use another app or service. We spent some time trying to connect it as a new device in the existing Hive app before we realised it needed something separate. For those outside the Hive system, this is a standalone camera, for those inside the Hive system, it's an ill-fitting piece of the puzzle. That you can buy this camera in Samsung livery with a SmartThings sensor makes the fact the Hive Camera won't work with wider Hive devices all the more irritating. The Hive Camera app lets you connect the camera to your Wi-Fi network and control the camera's setting and functions. That functionality includes the likes of sound and motion detection. But as it's totally siloed there's no compatibility with Hive's motion sensors, for example. We mentioned that this device has its own app (Google Play; iTunes). There's some branding, like a Hive flash screen and wide use of the orange colouring that Hive has adopted, but overall, the app also feels like an off-the-shelf solution. The interface (UI) is rather basic and there's very little parity between this and other Hive properties - it's an entirely different design language. While this doesn't pose a huge barrier to actual usage, it does detract from the Hive message. There are some bizarre visuals, like the portrait camera view, which doesn't include any UI sections until you tap on it, meaning two-thirds of the display is empty. Then there are other bizarre elements, like the way videos are shown on a clock face dial. In some ways you can see how some software designer arrived at that point - here are the times things happened - but a time list with a thumbnail would probably suffice. There's a microSD card slot on the camera (a 16GB card should be in the box, according to details on the Hive website) which you'll need to record video, with options for 720p or 1080p resolutions. Unlike some of the rival systems (Nest Cam or Netgear Arlo for example) there is no cloud side to the service, but there's also no subscription cost. That's a double-edged sword: it keeps the cost down (microSD cards are very cheap) and it can capture even if it doesn't have a connection to Wi-Fi, but if someone takes the camera, you lose all those recordings, leaving you only with a log of the alerts that were triggered - it doesn't even take a photo to record the trigger, which is a major shortcoming and something that should be added to alerts. We set the camera to 1080p resolution and found that we had filled about 8GB over 24 hours, although there was a lot of motion to be detected. There's the option to overwrite recordings when full, meaning you'd have to make sure you rescue any video you need. Sadly, there's no option to download or save video remotely, you'd have to remove the card and save the file to your PC - which means if you're away from home and need to save a video of something, you'll likely have a bit of a problem. Outside of recording, there's also live-streaming, with the option to change the resolution of the video (low, medium, high) or enable encryption. The latter option increases the bandwidth you'll need and this is a two-way feature - you need stable Wi-Fi at home, as well as to the phone you're viewing the stream on. If recording isn't your thing, or you have the Hive Camera setup as a pet monitor rather than a security camera, then this might suit your needs, letting you dive in and watch/check on an ad-hoc basis. You can change the sensitivity of the microphone or motion detection which means you can customise the trigger level to avoid regular things - perhaps the sound of traffic outside or your cat walking past. This doesn't go any deeper to the sort of clever interpretation that Nest IQ or Netatmo offers, recognising people and animals and being able to detect the difference between someone smashing the back window and your hedge swaying in the wind, but then you're not paying as much for the camera either. Hive Camera does offer some control, letting you draw a zone box so it only detects motion in a particular area. This means you can highlight a door or window and ignore the rest of the room. Detection is pretty good day or night and the resulting visuals are good too, with a great 130-degree view that will show your whole room clearly no matter what the lighting conditions are. One of the additional functions is a speaker that will play an alarm, police siren or dog barking. It's not hugely loud but means that you can manually use a deterrent noise if you see something happening. You can also speak through this camera, the idea being that you can soothe/confuse animals or tell your kids to stop fighting on the sofa. Again, however, the app design is a barrier here: it's not immediately clear how to do these things. One of the good things we've found is that even though the app isn't the best in terms of design or experience, it does seem quite stable and has worked reliably across our weeks of testing. There's been a boom in indoor cameras in recent years, meaning there are plenty of options to choose from. If you're already invested in Hive's wider system then you might think the Hive Camera is a logical choice. But that's not the case. There's Hive branding, sure, but the Camera operates on a different app to the rest of Hive and can't fully integrate with the wider system. So even a Hive user may as well examine the wider connected camera market, rather than stay loyal to Hive. It's not all bad though. This is reasonably priced indoor camera that's stable and capable, returning great visuals. It's cheap to run thanks to local storage, but unlike its competition it lacks the security of cloud storage for those videos, or even photos of the event triggers or the ability to download those videos. If someone steals the camera or removes the card, then your evidence is gone. It's also difficult to ignore the fact that there are plenty of other non-branded cameras that offer similar functionality for less money - it's only really the draw of increased functionality from branded cameras and integration with a wider system that justifies some of the higher prices, which the Hive Camera doesn't achieve. That makes the Hive Camera something of a mixed experience. Although it works well as a cheap camera in isolation, so could be ideal for pet monitoring, such isolation is also its biggest downside: despite the Hive branding, the Camera isn't truly part of the Hive system, so there's little to tempt the loyal to buy it. The Arlo Q offers much the same functionality as the Hive Cam with day and night motion and sound detection, 1080p capture and two-way audio function. It's also standalone, connecting to your Wi-Fi network. The big difference is that Netgear offers 7 days of online video storage, meaning that whatever it sees is stored online for you to retrieve it. The app is better constructed and more user-friendly, but isn't always as stable, especially in poor connection areas. The Netatmo Welcome offers a similar proposition to the Hive Camera with 1080p recording again being saved to microSD card. There's no cloud storage option, so again, no backup if your Welcome gets stolen. There's some clever technology onboard, however, with the Welcome deploying facial recognition so you know who is walking around your house. 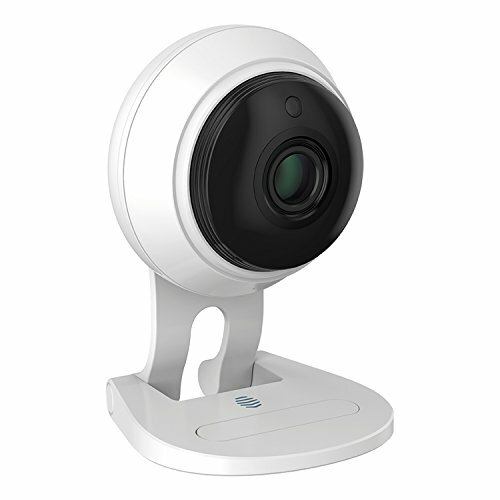 Nest Cam is one of the better known devices, integrated with the Nest system. There's no local storage on this camera, instead leaning heavily on the cloud. To get the best from the camera you need a subscription to Nest Aware, however, so there's an ongoing cost to ownership. However, the use of the cloud means that some of the clever processing is done off the camera, so the feature set keeps advancing.